Over the next few days, we checked on Starbird to make sure his single starling parent (the other bird, probably confused, closed the book on the whole deal) was still feeding him. He squatted on the five eggs, waiting for his foster parent to return with food. Since he didn't have a brood patch to warm them properly, the eggs wouldn't hatch now. 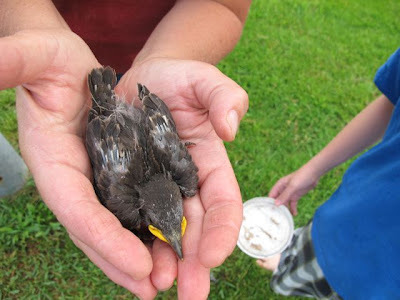 It's going to sound a bit odd, but I considered this a win/win situation: adorable foundling saved; five fewer potential starlings as a result. The strange math of a guilt-ridden rehabber's rationale. I have to admit he was durn cute, and we all got pretty fond of him. It was fun to see him grow and feather out, and not have to be feeding him ourselves. 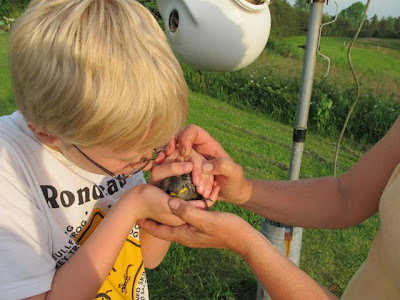 Liam checks him for mites. So far, so good. We got that infested gourd down just in time! Back in the gourd with you. Soon, he got so big and wiggly it was getting dangerous to remove him, for he was likely to take fright and try to fledge prematurely. This is the last photo of the whole Starbird. He's 14 days old here. At Day 15, we photographed him in situ, which turned out to be a mistake. 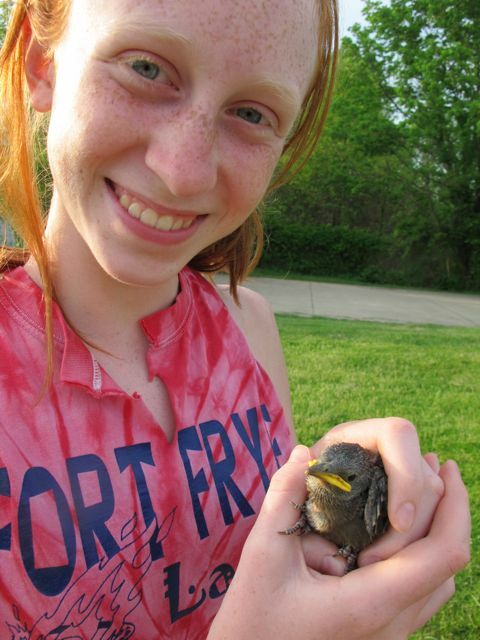 Right after this photo was taken, he shrieked and bolted out of the nest, landing with a fluttery plop on the ground. I chased him down, popped him back in the hole, covered the hole, waited for him to settle down, and smoothly raised the gourd, never to lower it again. 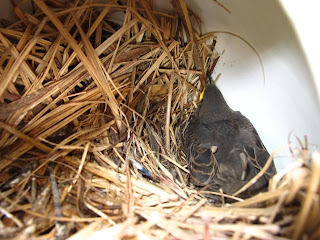 He was in the nest for another two days, and then I heard the characteristic harsh KWERR! of a newly fledged starling in the gourd. Interestingly, his parent removed the unhatched eggs the day before Starbird fledged, dumping them on the lawn. The next day, the strange little foundling left the gourd and was flying all around the yard, kwerring. Rarely, I'd see a parent starling, but he seemed to be mostly on his own. This is a peculiarity of starlings. 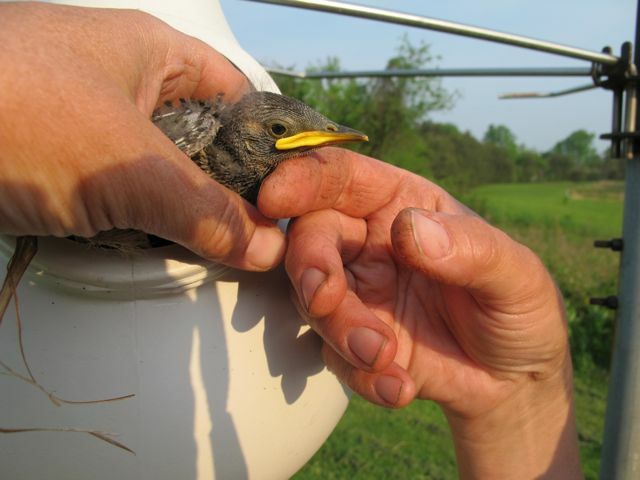 Believe it or not, a baby starling may be fed by a parent for only one day after it leaves the nest! sometimes as long as a week, but no more. I can't imagine a baby bird being ready to forage with that little subsidy, but starlings somehow pull it off. 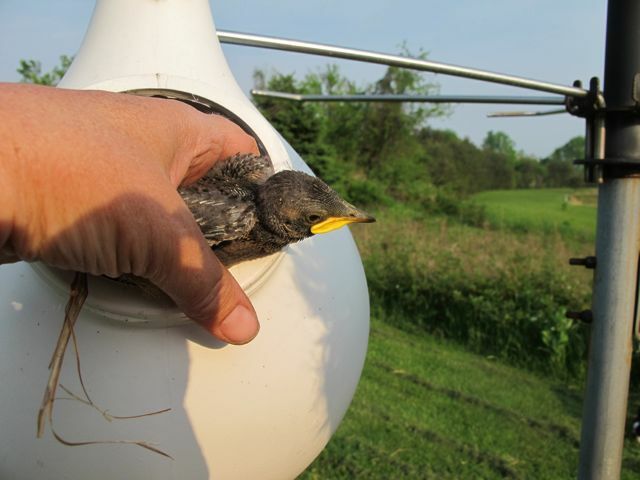 Starbird was lucky--I saw him chasing a parent three days after fledging. That day, he fetched up on the top of our tower, calling KWERR!, shouting his joy to be alive, hoarse thanks to his reluctant benefactors, both feathered and human. What an interesting and educational story! Thanks for sharing. with math like that you could have been a banker, or a politician.